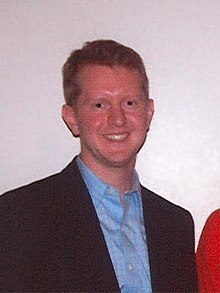 Kenneth Wayne Jennings III (born May 23, 1974) was the highest money earning contestant in the history of the American television game show Jeopardy!. He won a total of 74 times, earning $2,522,700. His winning lasted from June 2, 2004 through November 30, 2004. He lost after that time to a player named Nancy Zerg, who lost within a day to Katie Fitzgerald. He was brought back to appear in the final three games of the show's Ultimate Tournament of Champions. In the tournament, he lost to Brad Rutter, who became the highest money winner on Jeopardy!. According to the introduction given at the start of the show, Jennings is a "Software Engineer from Salt Lake City, Utah" His highest one day total was a record $75,000. Jennings is a member of the Church of Jesus Christ of Latter-day Saints, or Mormon. In February 2005, Ken started appearing in Cingular commercials as himself. In October 2008, Jennings appeared on an episode of Are You Smarter Than a 5th Grader?. He won $500,000, making him the highest winner in game show history. In February 2011, Jennings, along with Rutter, competed in the "IBM Challenge" against an artificial intelligence computer named Watson. Jennings placed second, losing to Watson. He won half of a $300,000 prize; with the other half going to charity. ↑ "J! Archive - Show #6088, aired 2011-02-16". www.j-archive.com. This page was last changed on 29 May 2017, at 21:05.